Obituary – Palovik, Duane Edwin « Perry High School Alumni Association, Inc.
F.F.A. ’42-’46; Student Council ’42-’43; Secretary of Home Room ’43-’44. ﻿Duane E. Palovik, 70, Perry, died at 10:30 p.m. Friday, July 10, 1998 at Mercy Health Center in Oklahoma City. Rosary and wake service are set for 7 p.m. Monday at the chapel of Brown Funeral Home. Funeral mass will be at 10 a.m. Tuesday at St. Rose of Lima Catholic Church. Rev. Kevin Devlin will officiate. Burial will be at St. Rose of Lima Catholic cemetery under direction of Brown Funeral Home. Memorials may be made to the American Heart Association. 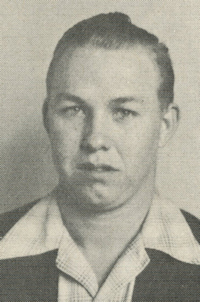 Palovik was the son of John P. and Charlotte Palovik and was born at Perry on April 14, 1928. He was educated in Noble County rural and Perry schools where he was active in 4-H and FFA. He was the recipient of an FFA Junior Master Farmer Degree. Palovik graduated from Oklahoma A&M in 1950 with a bachelor of science degree in agriculture economics. He was a veteran of the United States Army. He and Jo Ann Howerton were married on April 17, 1955. Palovik was manager of the Newkirk Farmers Coop from 1954-57, and later was senior vice president and director of Albright Title and Trust Company. From 1979-90, Palovik was employed by the First National Bank and Trust Company where he was senior vice president and manager of the Billings branch. Palovik was a member of St. Rose of Lima Catholic Church, Knights of Columbus and the Perry Elks Lodge. He had served as grand knight and was a Fourth Degree Knights of Columbus and had held the office of exalted ruler of the Perry Elks Lodge. He was a member of the Newkirk and Perry Lions clubs and held the office of Lion Tamer in the Perry Club at the time of his death. Palovik had served as president of the Newkirk Chamber of Commerce and a member of the executive committee of the Newkirk Diamond Jubilee. In 1969, he was the recipient of a Newkirk Achievement Award. He had held the office of president of the Perry United Fund, was a member of the Billings Rotary Club and the Billings Community Chamber of Commerce, was a director of the Perry Chamber of Commerce and served on the Perry City Council from 1991-97. His parents and one sister preceded him in death. In addition to his wife, of the home, survivors include two sons, Mike Palovik, Duncan, and Steve Palovik, Wichita, KS; two daughters, Dana McDaniel, Enid, and Dee Niles, Oklahoma City; two sisters, Delores Patak, Perry, and Pat Lewis, Hanford, CA; one brother John Palovik, Tulsa; and six grandchildren, Chad Waugh, Michelle Waugh, John M. Palovik, Chad McDaniel, Krista Palovik and Erik McDaniel.